IN 2015 Fairtrade Fortnight was launched with this short film. Today, Fairtrade tea is under threat by supermarket group J Sainsburys who want to ‘self certify’ their own tea as ‘fairly traded’ with themselves and decide which farmers should receive ‘their support’ Under Fairtrade, farmers are in control of their own Fairtrade funds and their certification is done by an accredited international independent charity. View the film and think before buying your tea without the Fairtrade mark. On Saturday 28th October, a coalition led by CAFOD are organising a day of action towards Sainsbury’s on the ‘Don’t Ditch Fairtrade’ Campaign. You can get involved in the day of action by handing in a letter to your local Sainsbury’s shop, taking a selfie and posting it on social media. There are more details about how to get involved and resources available here. 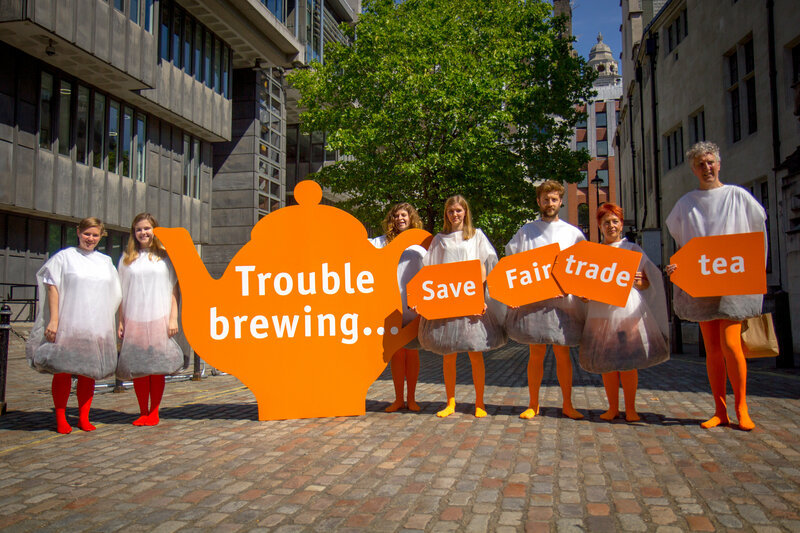 The day of action is important as Sainsbury’s decision to move away from the use of the Fairtrade Mark on their own label tea undermines the principle of producer empowerment. One of the principles of Fair Trade is that producers are empowered through capacity building and we do not believe that this is the case in the Sainsbury’s Foundation model as it appears that the equivalent of Fairtrade Premiums will be taken out of the control of the farmers and the producers and decisions will be made by a Board in the UK. The Forum’s key concern is not that Sainsbury’s are no longer going to use a particular certification for some products but that it is labelling the products ‘Fairly Traded’ when it does not seem to meet all the principles of Fair Trade. This can only lead to consumer confusion and lack of clarity and transparency. Key to Fair Trade is the empowerment of farmers and workers. In the case of this Sainsbury’s initiative, the representatives of the farmers and workers do not support the initiative. If you want to join the campaign and take action against Sainsbury’s then click here for more information and resources. 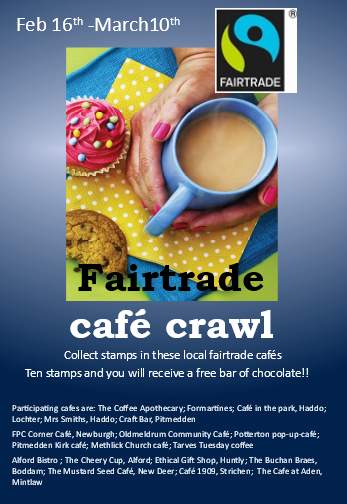 The wonderful sale of all things Fairtrade from Traidcraft, Zaytoun, Equal Exchange, Clipper and many more. All at Bonnyton Farmouse, at the end of Bonnyton Road, Pitmedden. Come and get gifts and essentials, clothing and foodie treats. Always coffee/tea and cakes & lunchtime soup available. Many supporters have been asking what the latest news is regarding Sainsbury’s decision to drop the FAIRTRADE Mark from their own-brand tea, so here’s a quick update on what’s been happening over the summer. Nearly 100,000 people have signed the Change.org petition started by Fairtrade supporter Barbara Gwinnett, and supported by Oxfam, CAFOD, Traidcraft Exchange and many more. The petition received a response from Mike Coupe, Sainsbury’s CEO, in July and you can read Barbara’s reply here. The Fairtrade Foundation remains focused on finding a way forward with Sainsbury’s that is in the best interests of the tea farmers and workers we represent, and are still hopeful that through discussions we can see their own-brand tea go back to being Fairtrade certified. A reminder that you can find our latest FAQs here, our response to Sainsbury’s announcement here, and Fairtrade tea farmers’ response here. And of course, please keep choosing Fairtrade certified tea and asking your friends, family and local community to do the same. We are a registered charity in England and Wales (no 1043886) and a company limited by guarantee registered in England (no 2733136).